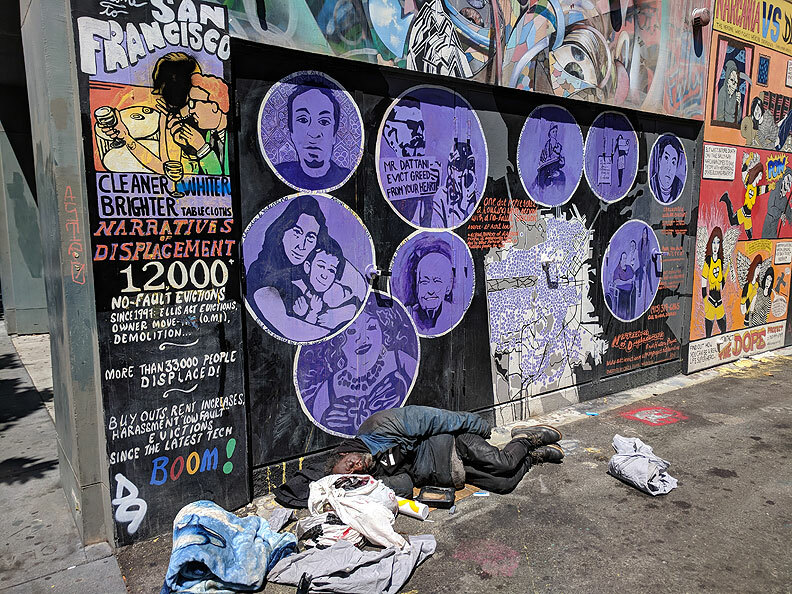 Dramatic tableaux vivant of homeless man sprawled in front of anti-eviction mural at the 17th Street end of Clarion Alley in 2018. The North Mission is demographically different from the 24th Street corridor. The North Mission is less vital economically, and while it borders on the predominantly gay and lesbian Castro District to the west, it also borders on the previously industrial, but since the seventies gentrifying, South of Market area to the south. Its residents come from a wide variety of cultures, and although there are taquerias in the area, there is no sense of a dominant Latino culture (or any other, for that matter). For nearly two decades, it was the location of the American Indian Center. In the 1990s, it became a center of young, hip-hop culture, and the BART stop at 16th and Mission is infamously the most dangerous stop in the system. The North Mission's "answer" to Balmy Alley is Clarion Alley, running a block away from the BART stop, just south of 17th Street from Mission to Valencia. 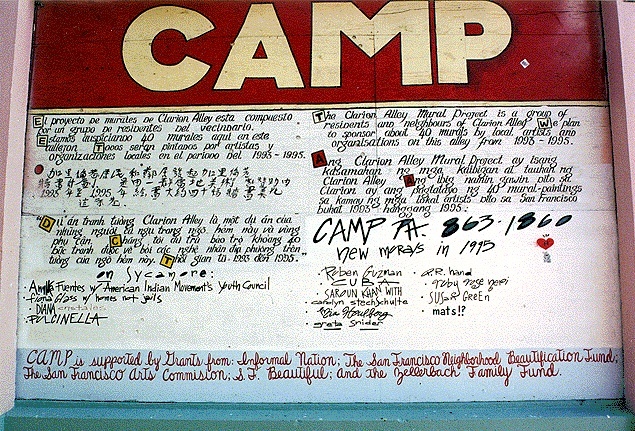 The rubric for Clarion is CAMP--Clarion Alley Mural Project, a reference to a specific place and project, without historical or cultural overtones. Clarion has no thematic focus comparable to Balmy's. The originating group was part of a new generation of community public artists. None had participated in Balmy, although they knew of the project. 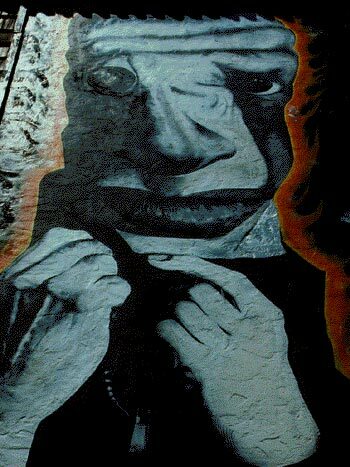 What is more, none had a background in mural painting. They brought an entirely new sensibility to the creation of a mural cluster. The project, or rather the tone of the project and the style of most of the pieces in it, may be labeled "postmodern" insofar as it exhibits characteristics of what has generally been described as postmodern, mainly its pluralism and self-consciousness. The specific context provided by Clarion was different from Balmy as well. Clarion had an ethnically more diverse set of residents and owners, but it was also the site of serious drug dealing and substance abuse, and was frequently used as an outdoor toilet by drug addicts. 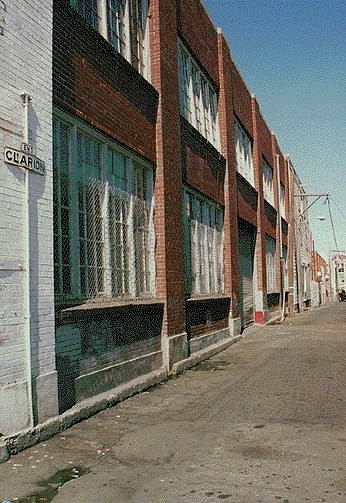 Although Clarion opens onto Valencia Street directly across from a new district police station, that had no impact on the alley's illicit users. One of the thoughts (it was hardly more than this) of the organizers was that if the alley became the site of artwork which brought visitors, then its "inhabitants" would be inclined to go elsewhere to defecate and shoot up. After three years of the project, there was some indication that this was happening, but it was still wise to be careful when visiting. A selection of Clarion's murals must suffice to indicate its character. Starting at Valencia Street, one sees a sign in several of the languages spoken in the vicinity announcing the project, and including a telephone number to call. This piece has remained in place for years without defacement, indicating the ongoing nature of the project (an important aspect of its process), and the respect by local taggers for the project. There are murals about the animals which lived in the area before it was settled and became a city, a tag of horses by Reminisce, and an abstract piece by Chuy Campusano, who had been an early San Francisco muralist in a social realist style, but whose style shifted to abstract/geometrical in the 1980s. Campusano's piece remained in black against a white background for over a year before he returned to color it. A small, vertical, 8' x 4' piece, cartoon-style Faux Mission Man, mocked in cartoon style visitors from the suburbs who came into the area on weekends because of its cool and slightly disreputable ambiance. There were initially two poems in Clarion, selected by the "poetry editor" of the steering committee. There was a collage, two doorways with full-length portraits of performing artists, and a particularly striking monochrome realist painting of an escalator. 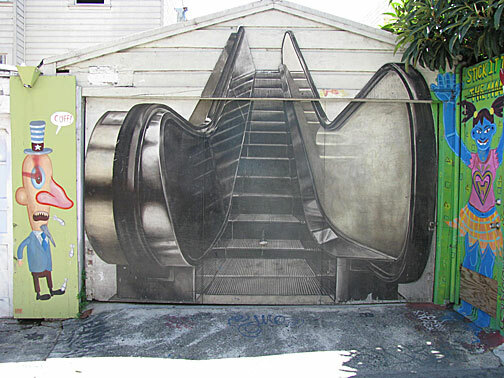 It is impossible to tell if it is going up, out of the alley, or moving downward into it. There are two "old style" murals, one by Precita Eyes Muralists and the other by Fresco, a team of Ray Patlan and Eduardo Pineda, both of whom worked in Balmy and on the ILWU Mural-sculpture. These murals are distinguished by their naturalistic painting styles and use of a full palette. 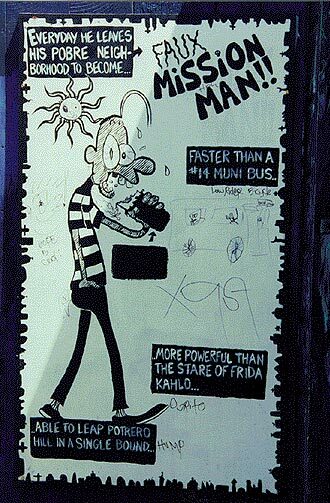 At the Mission Street end, Kenneth Huerta painted a portrait, Mojo Man, beginning at the top of the ground level and soaring up another two stories. Huerta's work is immediately identifiable because of what appear to be distortions in his monochromatic depiction. These are caused by his "sketching" initially in collage, which enables him to access images quickly, then transferring to the larger mural surface without gridding or projection. The overall effect of the project is complex and, as the above survey indicates, a departure from previous murals and mural clusters, although Clarion retains the impact of the cluster strategy. There is no theme or shared palette or stylistic consistency. Thus there is no claim to a unified perspective or even of agreement on what issues are important. In fact, Clarion is notable (at least compared with earlier murals) in its lack of issue-oriented murals. 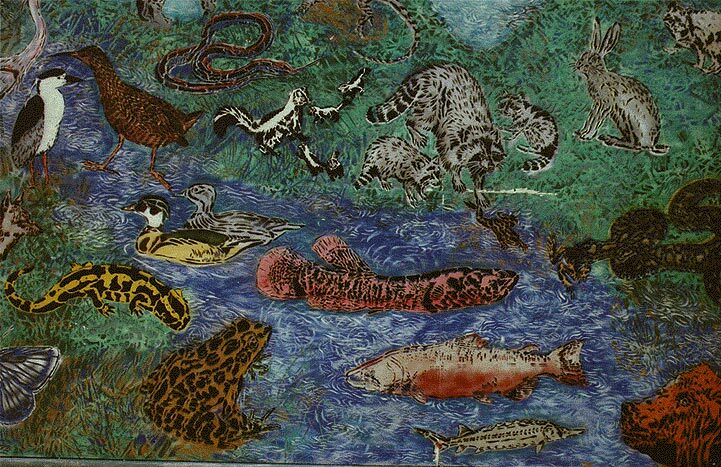 They are expressive of individuals, even existential (the escalator), but only the abstract piece noting the animals which previously inhabited the area touches on anything like a political issue of the sort that provided the basis of community murals through the 1980s. To put it briefly, CAMP is what earlier murals fought for. Whereas earlier murals fought against racism, Clarion celebrates (by providing a forum) individual sensitivities, expressions of self and (pomo) style, not issues, although the totality of the alley stands as subversively vis-a-vis dominant, commodified culture as do the earlier styles. In the nineties, however, CAMP's position was that allowing the "masses" (i.e., local inhabitants) to express themselves educates everyone to the variety in the neighborhood, and thus contributes to the creation of a mutually-respectful intercommunicative community. This is different from an attitude emphasizing "everybody do your own thing." A framework is provided: location, social context, specifics of the urban environment, and a collective spirit (albeit not collaborative, but, more importantly, not competitive, either). The organizers of CAMP, some of whom live in an apartment in the alley (which itself has a long history of housing artists, including an important Second Phase muralist, Michael Mosher), have been involved in two other projects in the nineties: the Bloody Thursday ILWU Mural Project and the Redstone Building project. Each in its way signifies the new generations politics and a major shift from earlier viewpoints.